Win one of three Blackstar ID Series amps! Enter now for your chance to win one of three Blackstar modelling amps! We're are giving away one ID:260TVP 100-watt 2x12 combo and two 15-watt ID:15TVP amps. One could be yours! It's a brave move ditching valves for modelling for a brand that, until now, has only made products containing those light bulbs we love so much. At least it would be, if the clever buggers at Blackstar hadn't done it so well. 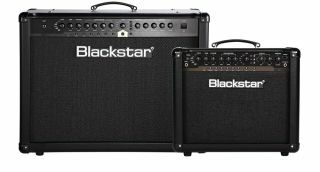 Instead of emulating amp models, Blackstar's ID Series focuses on referencing the actual valves themselves, from KT88S to 6L6s and more. There are also six channel voicings, taking you from clean to crunch to all-out distortion, plus 12 effects (four modulations, four reverbs and four delays). You can also connect to your computer via the USB interface for recording and deep editing of the amp's 128 presets. For your chance of winning for one these ingenious amps, ENTER HERE NOW!